TorboMate Crawler, a remote-control cleaning machine developed by Ecoblast Supplies, can take on vertical or inverted surfaces, automating the blast cleaning process. The cleaning robot turns out to be extremely useful for boat hulls but also towers, as it has already established itself in the wind industry in Germany. It measures 650 by 620 by 550mm, and its twin jet nozzles, located at the end of a long swinging arm, can traverse a broad arc, giving TorboMate a working width of 1,600mm and a top coverage speed of up to 72 m²/h – about five times faster than a handheld lance. Its electromagnets have been designed to resist the effects of seawater, and they exert a whopping 250kg of pull at a 3mm distance from a metal 10mm thick. In fact, it can even safely make its way all around the bulbous bow of a ship in dock. Onboard is an electric motor yielding 1.5kW of drive power: the crawler’s controls utilise a 24V battery or pneumatic line. The blasting jets do need a compressed air feed “though this doesn’t require a large or specialised compressor, just a 180 cfm, moderately-sized unit will do,” said Mr Flanagan. Internally designed swivel mounts are able to handle up to 3,000 bar water tools or, optionally, there’s a holder for sandblasting nozzles. Since it can be controlled from below, a TorboMate and portable generator and compressor could be shipped out by a support boat and put to work on cleaning and maintaining wind farms. The crawler is normally directed via a 24V control link, but in case the TorboMate is used in potentially explosive conditions, this can be changed for pneumatic switch gears and controlled via a wireless hand-held device. 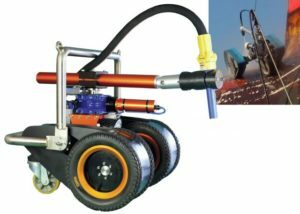 Ecoblast will showcase its TorboMate Crawler at the 2018 edition of Seawork International (Stand SR14) in Southampton in the month of July.